PT Problem of the Day: When is a Smartbus not a Smartbus? When is a Smartbus not a Smartbus? When it’s the 703. 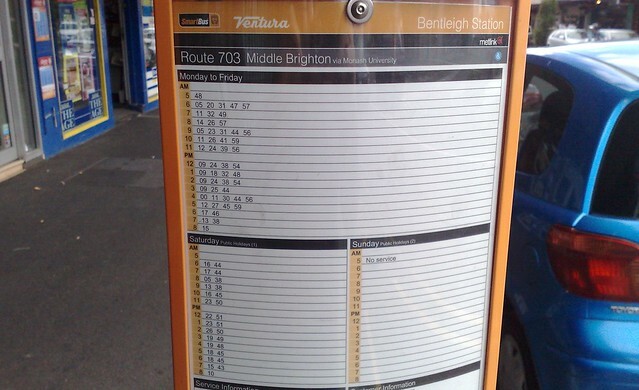 While the other Smartbus routes offer reasonable good (though not perfect) services, the 703 is called a Smartbus, but doesn’t meet the Government’s own standard for Smartbus services. It doesn’t run until midnight; its 15-minute services finish around 6pm, not 9pm (making it far from ideal for evening peak commuters); its Sunday services are about every 40-45, not 30 minutes; part of the route doesn’t operate on Sundays at all. Despite overcrowding on the route at times, particularly between Monash University and Clayton (even on weekends) there appear to be no plans to fix the problems.